There are “ Super Predators” in teh backcountry at present…8-10 foot Bull sharks, blactips and sand sharks. These sharks are there because there food is present……Tarpon! Congratulations to Scott and Ryan Reidel who braved the wind and have good success on snook and redfish. Also to all of those that got their first snook on fly…Chris Mohr, Scott Reidel, Juan Jimenez, Scott Allan, Haden, Brook, Congratulations! Lots of Tarpon in Charlotte Harbor at present and backcountry….time to break out the 12 weights! March has been good with lots of backwater fishing topping the list. 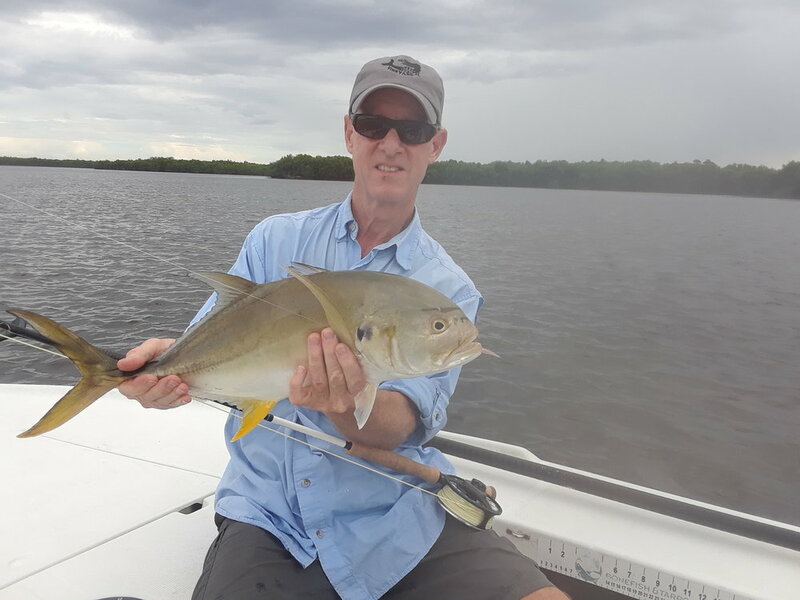 Excellent fly opportunities sightfishing snook and reds. 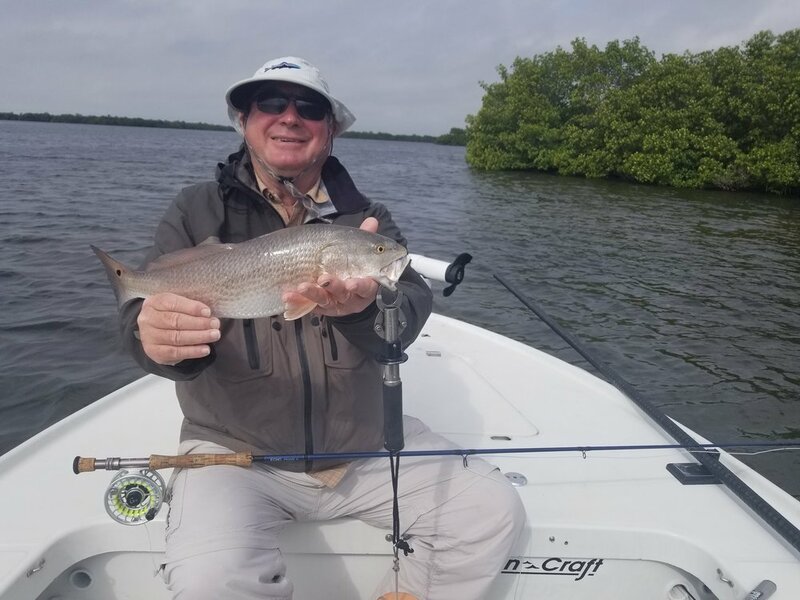 Trout are solid on shallow grass flats in the early morning with Gurglers and Crease Flies getting the bite. The beach has been quiet but mackerel have been present just offshore with Kings also on the bite in deeper water. Hopefully the last of the cold fronts have past and fishing can return to normal. The red tide is long gone and beautiful clean and clear water makes sightfishing a must try. Terry Byce with another nice night snook…. January was filled with high winds, low tides, cold weather and water temperatures but we still managed a few quality fish. When the sun did come out sightfishing was pretty good with lots of smaller snook being caught and a big trout and a few redfish. Presentation was the most important ingredient for success. We lost a lot of days to high winds and rain, totally unfishable with no visibility adding to the discomfort. When we did get out we found lot of big fish but they so cold they had no interest in chasing a fly or lure. February temperatures will be in the 80’s during the day…Can’t Wait!!! December has been, as usual, good and bad. The warm sunny days are excellent for sightfishing with good shots at big snook and redfish. There are plenty of seatrout on the grass beds early in the am that have been taking Gurglers and Crease Flies. As far as snook and reds, baitfish patterns and tailing patterns produce the best. We have also been traveling to the Everglades to fish for panfish….especially Oscars…pound for pound nothing else compares to their fighting ability. 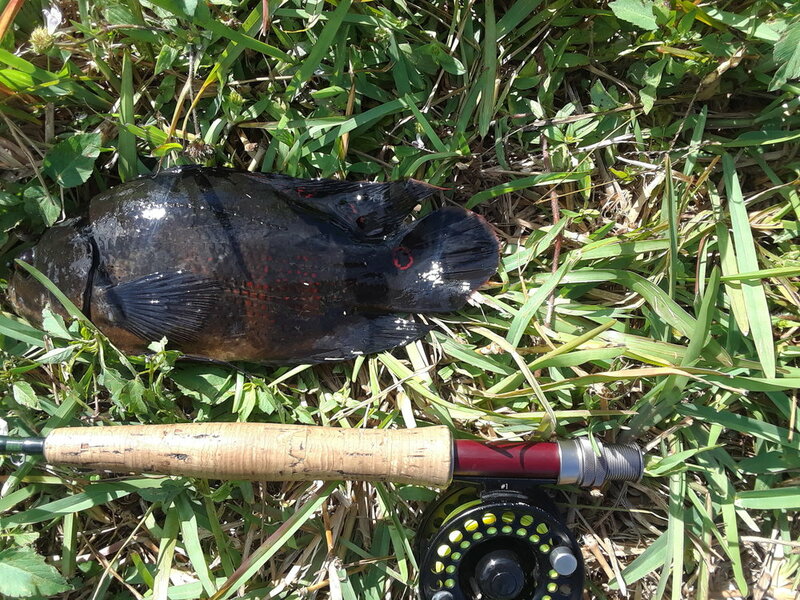 We also catch Myan Cyclids, bluegill, perch and stumpknockers. It is a lot of fun walking the banks of the many canals in the Everglades and casting to visible panfish. Night snook is still rated good, although with colder water temps, the snook are entering the river systems in search of warmer weather and their winter haunts…. All in all, still lots of fish to be caught exploring the outside bars and flats…. With the cleaner water and cooler temperatures we are expecting a blitz of False Albacore to arrive in later October or Early November mixed with Spanish Mackerel and King Mackerel which will be on the beach frothing up the surface and hitting Cuban Anchovy patterns and smaller tan baitfish patterns. Also available in November will be Triple Tail… which will range from a couple of pounds up to 20lbs…..
FWC , in order to bring back some of the lost snook and redfish, FWC has made a Zero limit on snook or redfish until further notice….We can still catch all we want, but catch and release is mandatory. Trout,, Triple Tail, Pompano, Mangrove Snapper and all of the rest are open. Lots of topwater action on Gurglers and Crease flies as well as baitfish patterns. Water is getting colder and fishing is only going to get better!!!! August fishing is getting much better with good catches of Big Seatrout, Redfish and Snook. The Red Tide is basically gone from the backcountry , the water is clearing and it is fishing as usua,finally.... Snook are co-operating in the back country staging around the mangroves on the incoming tide and redfish are hanging around the oyster bars. Seatrout are in the deep cuts bordering the grass flats and have been striking surface flies, Gurglers and Crease flies as well as Zara spooks and Skitterwalks... With the water cooling and the fall approaching, Redfish will start schooling and seatrout will graze on the shallower grass flats. We have also been catching a few Cobia on the flats...lFishing the early morning is best and getting off the water by noon to avoid the heat and afternoon thunderstorms. Snook fishing is good fishing inland docks and canals....lots of current movement producing the most fish to 28"
Alex Rubino had a great day of tarpon and snook fishing. He fought a triple digit fish for an hour before the leader frayed and broke. I leadered the fish three times but never could control her. We then chased snook and he caught snook to 27". The day before we chased bluegill in some of the local ponds....where he caught many. 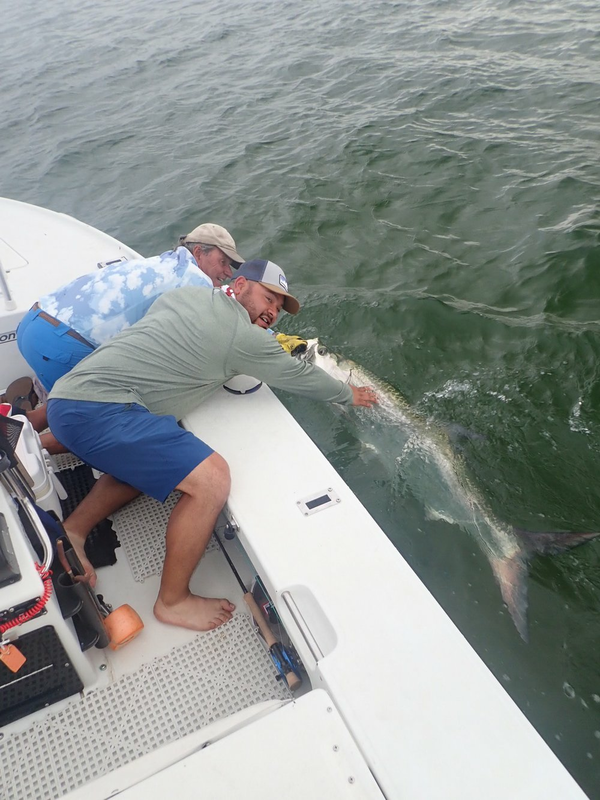 June promised to produce more fish and better conditions until end of month..
May is here and so are the Tarpon...Lots of big fish in Boca Grande Pass and fish starting to show on the beach. Jumped two poons May 4th in the backcountry and then started to fish the beach May 6th and connected with an 80 lb tarpon on fly.... Great fight, she jumped 7 times and finally landed her.David Pustejovsky fought her for 45 minutes and did everything right, putting plenty of pressure on her throughout the fight. She was released, and happily swam away. Video is on my facebook page Boca on the Fly, capt. Al White. 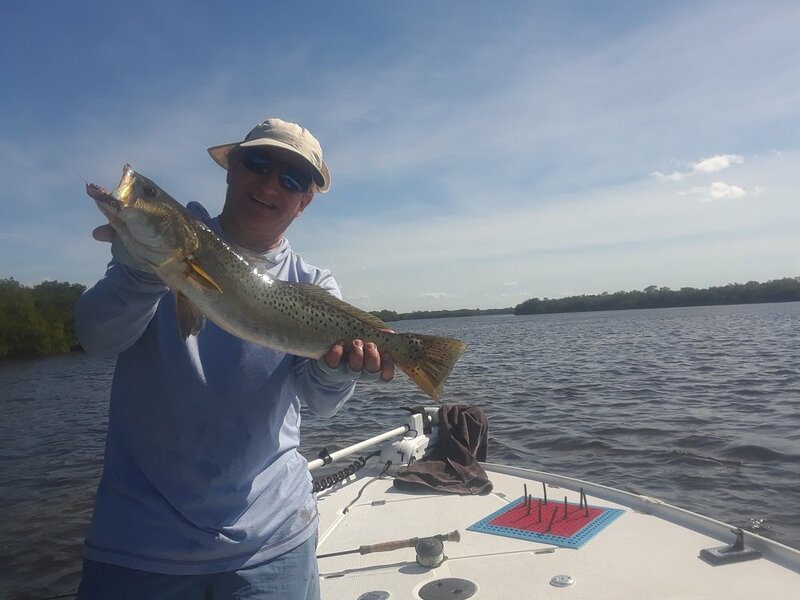 Trout are abundant on grass flats with good topwater action to be had on fly and plug...Fish to 24inches are common right now. We are booked pretty solid for Tarpon Season but have a few days open in June....Don't forget about July....yes it is hot but so are the fish....no pressure and ready to eat! Not as many fish, but the ones you see will chew!